I have got some bad news for Christian Mistress. For a young band which is not following a once walked path, but rather trying to do their own thing, when your production is homemade and has a lot of rough sown edges, do not expect a big label come a-calling with a multi-album contract. When your sound brings out warm familiarity, yet has no clear convenient analogy to be placed on it, you are certainly not doing it by a cookie cutter principle. Something not to be rewarded with big bucks either. If you pump a lot of heart in it, surely you will (and should) get rewarded by the underground zines singing you praises, and, hopefully, you will start growing a faithful following, but this is about it when it gets to good news. Olympia, WA, label 20 Buck Spin did the heavy metal world a favor when they played a little home buddy favoritism and released a debut long-player of the locals Christian Mistress. With Agony & Opium the band managed to combine some sing along chorus melodies of European 80s metal, some speedy Americana thrash, blinding dual guitars interplay, when needed, and old classic feel from both sides of the pond. Being female fronted, the first and the most obvious comparison would be the old Warlock, but Christian Mistress is more cutting, more to the bone, and has some Slough Feg/Hammers of Misfortune in their riffs and leads (Poison Path). Although some song parts seem to be thrown together a little haphazardly (Riding on the Edges), Desert Rose and Home in the Sun verses seem to be a little chopped up and unbending, the grinding and gliding of the two aforementioned songs come chorus time is so undeniably catchy, you mind will not be able to expunge them. Twin leads to die for (Home in the Sun) and the 80s power gallop of Black Vigil will have the crowd going wild in the live setting, and, somehow, I have all confidence in the world that Christian Mistress is a powerful live experience, without ever witnessing the band. How could they not be with their energy and devil-may-care attitude? 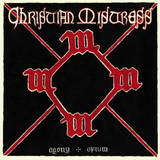 Christine Davis is a perfect lead singer for Christian Mistress. Not strong technically, and missing a high note here and there, she is absolutely human when it gets to belting out those choruses on Home in the Sun and Desert Rose. A blaring evacuation siren at times (Poison Path), she delivers perhaps her best and most powerful performance in the semi-balladic closer Omega Stone, where after Christine power carries the song at the beginning, the band can’t resist the speed beckoning and the composition grows heavy and becomes downright heroic at the end. The mix of Federica De Boni (White Skull), Yuko Hirose (Fatima Hill), and most definitely Doro, Christine’s throaty raspy vocals is something all of the Christian Mistress guitar prowess would not be able to do without. So, to sweeten the pill for Christian Mistress slightly, let’s all go out and seek this 30 min unpolished gem of heavy metal. The band is well worthy of your attention.